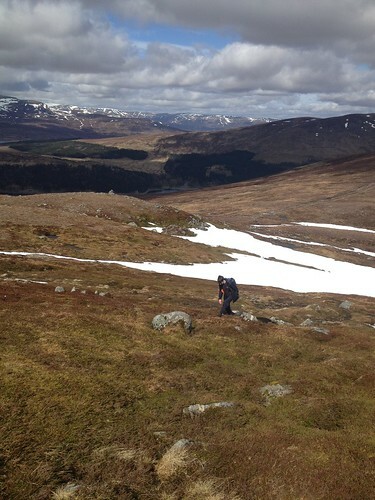 Given there had been a significant thaw and the weather forecast was decent I decided it was safe to take young Bob Beag with me back out on the hills. Most of my walking has been in the west. West is best after all However, I decided it was time to venture somewhere new and the Drumochter 4 to the west of the A9 seemed like a good option. We arrived at Balsporran cottage just before 10am after having played a game of spot the road-kill pheasant on the A9 (we got bored at 27!). After sticking our boots on an something to keep the wind off we headed to the level crossing over the rail-tracks. Following the landrover track was a nice gentle introduction after having been sitting in the car for a couple of hours. Soon the track ended and we followed a rather muddy and in places indistinct path up to the sentinel cairn. 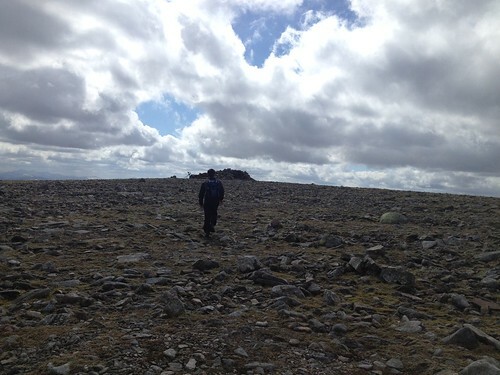 From this cairn the summit of Gael-charn was visible and the ascent gentle so we made good time in reaching the summit. 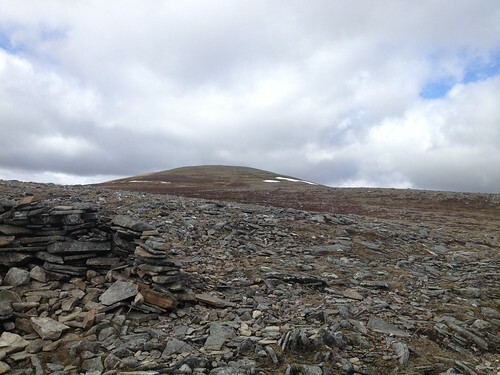 (Looking to the summit of Gael-charn). 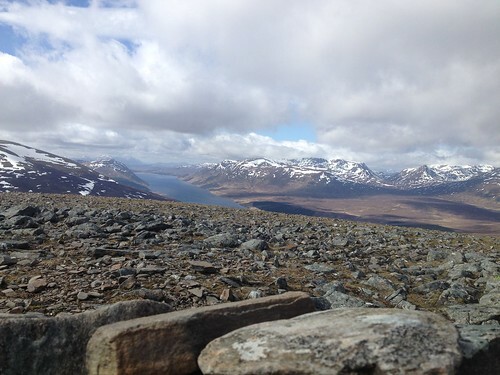 From the summit we started to get great views of Loch Ericht and the Ben Alder hills. It was nice to be out of sight of the busy A9 and have a real sense of wilderness. We decended to the bealach where we picked up a rough land rover track for a short distance before heading up toward the broad ridge between a' Mharconaich and Beinn Udlamain. Given this was north facing there were more patches of snow than on Gael-charm. Bob started to lag behind a little and in the background you can see Gael-charm from where we'd just came. Although he was lagging behind me a little he was walking bang on the time calculations I'd made following Naismith's rule so he was doing great ...so long as I kept feeding him. 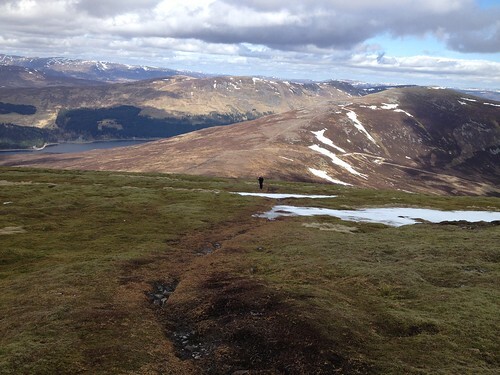 To make things a little easier for him I put his rucksack on one of the fence posts as we'd be returning to the same spot after wandering along to the summit of a' Mharconaich. The rise from the ridge to the summit is very shallow and we reached the summit and the big stone shelter in no time at all. 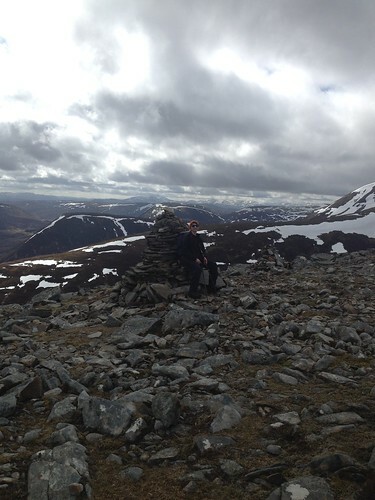 (Bob at the sumit of a' Mharconaich with Sgairneach Mhor in the background). 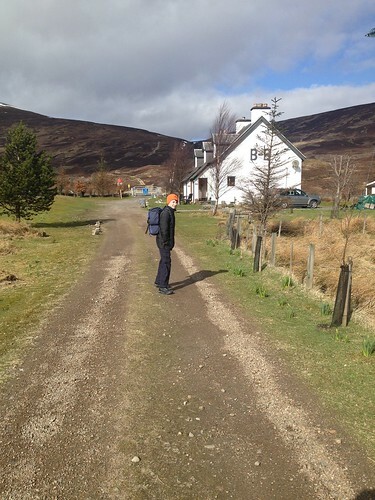 We headed back to where we'd left Bob's ruck sack. His heels were starting to get a little sore but I'd packed some blister plasters and after we'd stuck these on he was fine. Planning a for wee things like this really does make a difference. 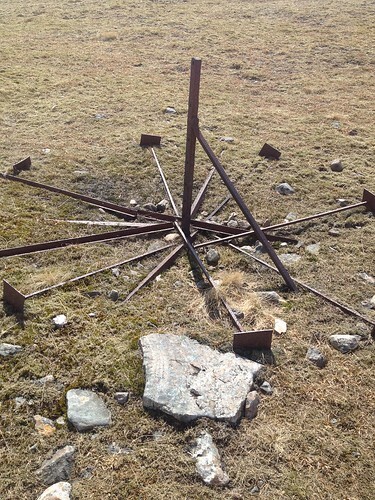 There's a line of old metal fence posts that form a helpful navigation aid and we followed these to the next summit, Beinn Udlamain. (Someone had been creative with the posts). 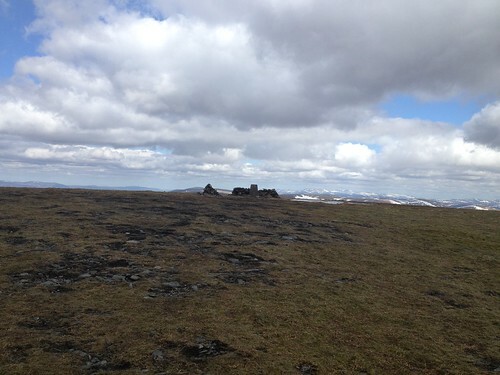 There is a very sizable shelter cairn at this summit. We sheltered here for a few minutes to eat some more food and encourage Bob that he was doing great and had it in him to complete all four hills. The decent from Beinn Udlamain was quite steep and we needed to watch our footing on the loose rocks. We did not follow the ridge right down to Carn'lc Loumhaidh but took a more direct route onto the shoulder that would take us to a false sumit at 940m before we pressed onto the true sumit of Sgairneach. 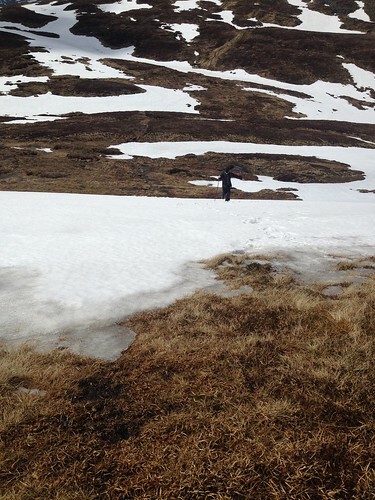 There was more snow here than elsewhere on the walk. 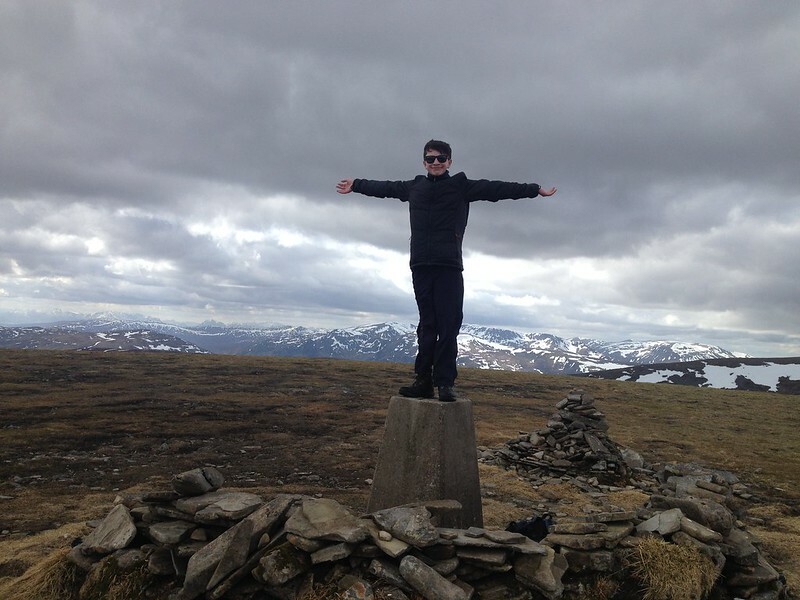 The concrete trig point marking the summit soon came into view and once there we took the obligitory photo of standing on top of it. Bob had done a great job and mindful of the long walk back to the car I decided that tagging on the Sow of Atholl was for another day. We headed along the edge of the corrie making sure we were a safe distance back from the cornice that looked like it could collapse any minute. Indeed, once we were able to look back into the corrie there was plenty evidince of avalanching. We soon lost the path so picked a bearing that would reach one of the bridges over the river and down we bounced through the heather and boggy peat. The heather was full of grouse and at one point Bod nearly tripped over a hare who was still in his winter white fur. Once on the landrover track the we followed this to the underpass for the railway and then joined the cycle track which would take us back to the car. 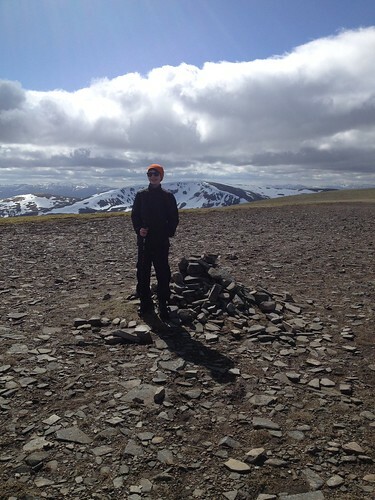 It was a grand day out and the views over to the Ben Alder area were fantastic. Thanks for the comment. Most of the people we met while walking were also doing the walk in opposite direction from us, i.e. the same direction as you. I did suspect that the snow had been very deep and there were a few spots where the snow has gathered in drifts where there is still some depth to it. Bmg99 wrote: Thanks for the comment. Most of the people we met while walking were also doing the walk in opposite direction from us, i.e. the same direction as you. I did suspect that the snow had been very deep and there were a few spots where the snow has gathered in drifts where there is still some depth to it. Mentally I felt walking ‘down’ the A9 afterwards would be easier but in reality it wasn’t downhill at all and was entirely horrible. There were loads of ski tracks when I was there so plenty of folk had fun in the snow.